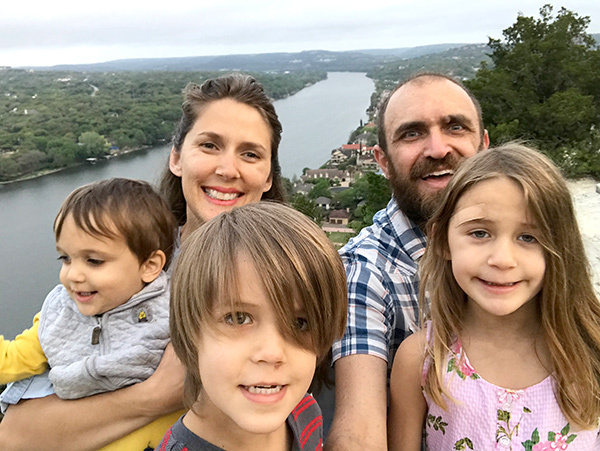 Recent family photo on the top of Mount Bonnell after the Easter sunrise service our Church had. Wow, 2018 is FLYING by at lightning speed. It seriously seems like Christmas of 2017 was just yesterday! Spring has now arrived, and we are no longer running the heater in our RV on a daily basis, although the past two days have been an exception. Summer is fast approaching as well, and we are pondering what our next big adventure might be. We don’t know for certain yet, but there are a few possibilities, including moving to a new RV park as our permanent home base, as well as traveling the US as part of work for Bearded Brothers. The one thing we know for certain is that Midtown RV Park is closing down at the end of the year. Although they have not even given residents official notice, management is letting new tenants in on the information, and the rumors have spread all around the park. I did confirm by looking at the City CAD property search, that an investment group has purchased the property. We are currently looking at moving into La Hacienda RV Resort in Lakeway. It will be a huge adjustment for us, as all our close friends live in Austin proper. We also won’t be minutes from downtown anymore, and we won’t be biking distance to awesome coffee shops either. The up sides to this RV park are pretty substantial though. It’s a large community, it’s safe, they have a huge laundry facility on-site, propane on-site, daily trash pick-up, a pool, workout facility, playground for the kids, and a nature trail around a small lake. I’m sure it will be a place we enjoy living, the only downsides I see are being further away from Austin proper, but being in Lakeway we will likely find new hangouts, and go-to restaurants for those days we just don’t want to cook. As for traveling during the Summer, it’s looking like that is not going to happen. At least not anything long term. We will more than likely get away for at least a couple of weeks. There are family commitments already on the schedule, and it’s looking like my business (Bearded Brothers) is going to need my undivided attention this entire year. But…with some of the potential growth we will experience through the business we might end up traveling a bit more throughout the year to visit trade shows and open new store accounts. It’s not a certainty yet, but there is a good likelihood it will happen. Our kids are growing up fast too. Abby is now 5, and turns 6 in September. Josh is turning 4 in May, and Nathan will be 2 in September. Before you know it, homeschooling / roadschooling will be in full force! It’s been amazing watching our kids just learn on their own though. The things they pick up never cease to amaze. Abby is already learning to read, all be it at a slow pace, but pretty much self-initiated. All three of them are little sponges and just soak up any information they receive. The amount these guys can remember is astounding. Even though we can sometimes fear change, even now, we look forward to the new adventures this year will bring. There are many unknowns, especially in regards to where exactly we will live, and the amount of travel we will be doing, but we look forward to taking them on, one adventure at a time. 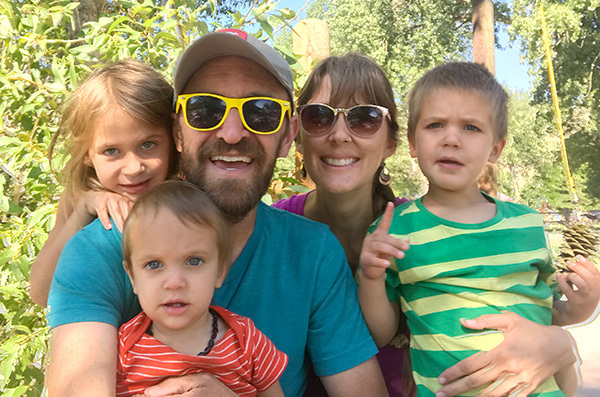 Adventure Note: We do know for sure that in just a couple weeks we will be heading to Big Bend National Park for a family vacation. We have only traveled once since last October, so we are really looking forward to being on the road again. We have no agenda set, we just know the dates we will be traveling and look forward to exploring Big Bend, it will be the first visit for everybody in the family. 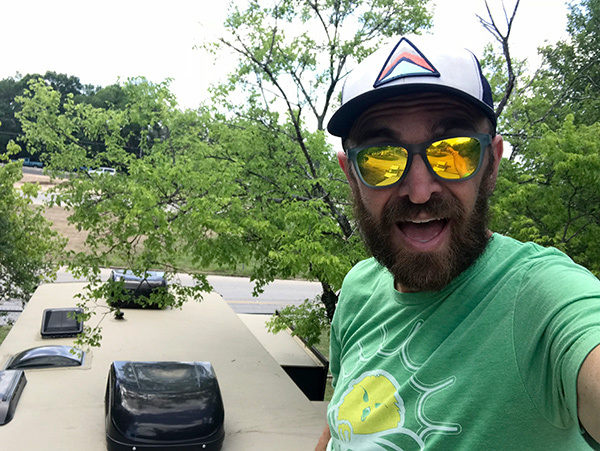 Spring cleaning: swept off the roof and patched some potential leaky spots with dicor. We have also been doing a lot of spring cleaning in preparation for our trip. We try to do this a couple times a year. So far, I have cleaned the roof and patched a couple problems spots. We have purged both the inside and outside of the RV of things that are not being used. I’m pretty sure our rig is at least 100 lbs lighter. We’re ready for an adventure! So happy you guys found a great new place to live. We will have to come check it out later this year when we make it back to the area. Bummer about Midtown! And super bummer that we will miss you guys in Big Bend. It is one of our most favorite places on earth. There are a few great dry camping areas for RVs in the park, search for Boondocking Big Bend in our blog if you get a chance. This time of year you shouldn’t have too much competition for the spots. Enjoy and say hello to the Town Mayor (a goat!) of Lajitas for us!